Sending a handwritten thank you letter to your customers is a great way to increase referrals and repeat business. Here, we will cover some strategies for how your business can utilize thank you notes to increase customer engagement with your business. Also, below weâ€™ll provide some sample customer thank you letters that you can use as templates to begin your campaign of gratitude. Should You Personalize Your Thank You Notes? This depends on the type of business you run, and how many customers you need to thank. In general, a more personalized note will have a bigger impact. But, in some industries a customer will be thrilled to receive any acknowledgment at all. For example, if youâ€™re a realtor you might only need to write 20 - 40 thank you notes in any given year. If one of these notes leads to a referral, the ROI on the thank you note is huge. So, personalizing each note is probably a worth while time investment. However, if you are a large company that needs to thank 500 vendors, a templated note is going to make more sense. Handwriting is the way to go. Donâ€™t let your thank you letter get lost in a sea of e-mail. 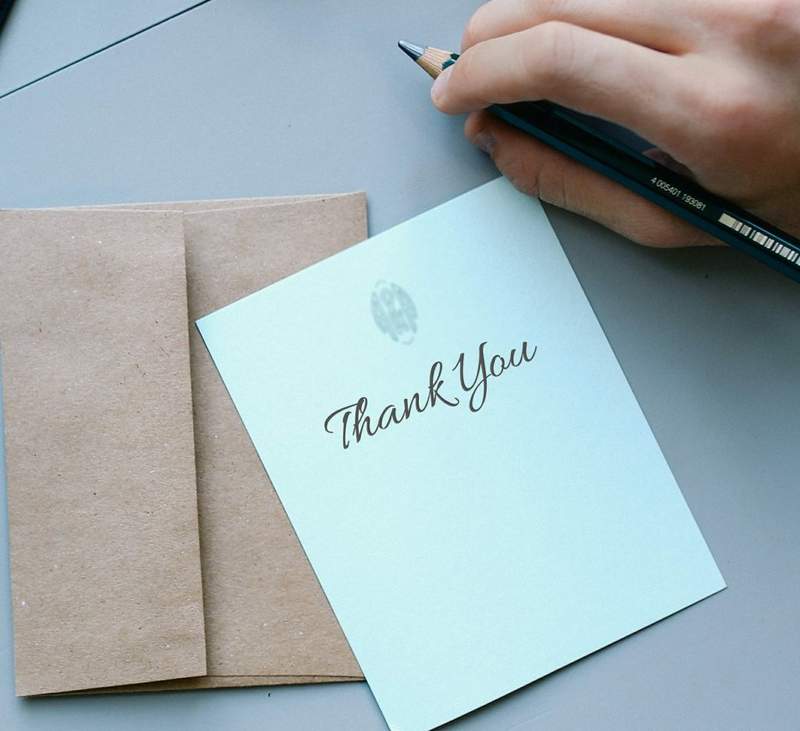 As snail mail becomes rarer, your handwritten, mailed thank you notes will stand out that much more, giving your brand a huge boost. There is no bad time to send a thank you note, but certain times can make more sense than others. The end of the year is a common time to thank vendors and valued customers. However, there are a few reasons to avoid the holiday thank you card. Would it make more sense to send them at a time of year when receiving cards isnâ€™t as common, and folks are less busy with family? For larger sales (real estate, cars, etc...), its a good idea to send a thank you note soon after the deal goes through. This way the customer will associate the positive feelings of receiving your note, with the experience of buying from you. A great way to say thanks to an existing customer is to include a special offer or discount with your thank you letter. Just donâ€™t be too sales-y. This letter is for saying â€œthank youâ€ first and foremost. You donâ€™t want your clients to think youâ€™re just fishing for more business. As the year winds down, we want to take the opportunity to thank you for carrying our coffee for the past year. Having exceptional coffee houses such as yours representing our company is what makes us successful. I canâ€™t thank you enough for carrying our beans, and I look forward to working with you all in the coming years. Thank you so much for trying out Bonsai Salon last month. We absolutely love when new customers give us a shot. I hope that youâ€™re enjoying your new haircut, and we look forward to seeing you again soon. It has been a couple months since we closed on your property at Seaside Hills, and I just wanted to take a second to thank you for choosing me to represent you during your house hunt. I truly enjoyed showing you two all of the beautiful -- and not so beautiful ;) -- homes in the Bedford area. Iâ€™m so pleased that we eventually found the perfect place for you guys. Knowing how much you love your new home puts a smile on my face, and inspires me to work that much harder to find great properties for my current clients. If you or someone you know is ever in need of a realtor around these parts, I hope youâ€™ll think of me. Thanks again for the wonderful experience. We are truly grateful to you for choosing us as your best [xyz] service provider/product dealer. You are our on of our most highly valued customers and it has been a sincere pleasure serving you this year. Speaking on behalf of the company, we hope that you have enjoyed the enhanced quality of our products/services. We will continue our efforts to meet your requirements and expectations in the future as well. Meanwhile, your unwavering support and patronage is what gets us out of bed in the morning. Your honest suggestions and feedback have helped us shape our business to best fit your standards. As a token of our appreciation, we are soon to introduce al discount offer for our regular customers like you. Also, if you make more purchases and referrals in order to be eligible for bigger discounts with our upcoming offer. Again, thanks so much for choosing [company name]. Let us know if there is anything we can ever do to assist you further. Thank you so much for your recent business with [Company Name]. It is customers like you that help keep our lights on, and we couldn't be more grateful. I hope youâ€™ve been as delighted to work with us, as we have been to work with you and your exceptional team. As our way of saying thanks, please enjoy a complimentary 20% discount on your next order (code: 20dpor). Thanks again for your business. We truly appreciate it. Please let me know, personally, if there is anything we can do to help make your business thrive. As you can see, there is no reason you need to personalize the entire letter. The example above reads like an individually tailored letter, although all but one sentence could be used for multiple customers. Here is another example that is a little more generic and could be used to send to out to a broader customer base. Learn how to write the perfect post-interview note. Read business thank you letter examples. Read sample thank you letters for students and college graduates. Thank you letters for personal situations. © thank-you-notes.com. All rights reserved.